The Great Highway Gallery is excited to present Bordering On. The exhibition will feature an installation, photography, and programing from Pam Longobardi’s Drifters Project. The programing will include a Forensic Beach Cleaning at Ocean Beach Stairwell #4. Volunteers will remove plastics from the coastal zone while documenting and searching for messages. Pam Longobardi’s parents, an ocean lifeguard and the Delaware state diving champion, connected her from an early age to the water. She moved to Atlanta in 1970 and saw her neighborhood pond drained to build the high school she attended. Since then, she lived for varying time periods in Wyoming, Montana, California, and Tennessee, and worked as a firefighter and tree planter, a scientific illustrator and an aerial mapmaker, a waitress and a bartender, a collaborative printer and a color mixer. Her artwork involves painting, photography, and installation to address the psychological relationship of humans to the natural world. After discovering mountains of plastic on remote Hawaiian shores in 2006, she founded the Drifters Project, centralizing the artist as culture worker/activist/researcher. Now a global collaborative entity, Drifters Project has removed tens of thousands of pounds of material from the natural environment and re-situated it in social space. Winner of the prestigious Hudgens Prize and Distinguished Professor at Georgia State University, Longobardi has been featured in National Geographic, SIERRA magazine, the Weather Channel and in exhibitions across the US and in Greece, Italy, Monaco, Germany, Finland, Slovakia, China, Japan, Spain, Belgium, Poland and the UK. The work provides a visual statement about the engine of global consumption and the vast amounts of plastic objects and their impact on the world’s most remote places and its creatures. Longobardi’s work is framed within a conversation about globalism and conservation. Join Pam Longobardi on a forensic beach cleaning mission of Ocean Beach. Longobardi’s Drifters Project method involves a heightened sensitivity to searching for clues and information in the form of messages from the ocean that may be revealed in the vagrant floating plastic. Volunteers will remove plastics from the coastal zone while documenting and searching for messages. Bring cell phone/camera, cloth collection bag or buckets, gloves if desired, and an open heart. Discussion following at the gallery. The works in Bordering On form part of a continuum of the work of Drifters Project that I have been engaged with since 2006. After discovering the mountainous piles of plastic debris the ocean was depositing on the remote shores of Hawaii, I began collecting and utilizing this plastic as my primary material. Since then, I have made scores of interventions, cleaning beaches and making collections from all over the world, removing thousands of pounds of material from the natural environment and re-situating it within the cultural context for examination. I approach the sites as a forensic scientist, examining and documenting the deposition as it lay, collecting and identifying the evidence. Plastic objects are the cultural archeology of our time. These objects I see as a portrait of global late-capitalist consumer society, mirroring our desires, wishes, hubris and ingenuity. These are objects with unintended consequences that become transformed as they leave the quotidian world and collide with nature to be transformed, transported and regurgitated out of the shifting oceans. The ocean is communicating with us through the materials of our own making. We are remaking the world in plastic. In keeping with the movement of drift of these material artifacts, I prefer using them in a transitive form as installation, often accompanied by forensic site photographs of its deposition. Having worked in Greece for the past 7 years on Kefalonia, my most recent work engages the refugees and citizens on the island of Lesvos, the small Aegean island that has received nearly 600,000 refugees on its shores, arriving day and night on all manner of floatation devices: life vests, rafts, even pool floaties. 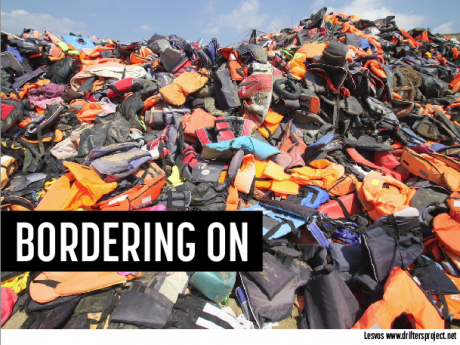 The life vest itself, a tool of survival, is a signal of the new world of climate migrants and refugees as humans now join the global material drift. Stained and tattered, the vests mark the physical evidence of the human wave of global transformation in the Anthropocene and persist as the stitched fabric of a new world. They also mark the need for extraordinary efforts of humans to care for one another, and the non-human living world.